Dell has introduced what it claims is the "world's first fully functional" mini PC. The Optiplex 780 USFF - for "ultra-small form-factor" - measures just 24 x 24 x 6.5cm, which is actually bigger than Apple's Mac Mini, for instance. However, unlike the Mini and other mini-PCs, the 870 USFF has is power brick inside the chassis, Dell said. It also uses desktop components - most similarly sized machines rely on parts designed for notebooks - with the exception of the optional Wi-Fi card and the storage, which is a 2.5in form-factor part: a 250GB HDD, 160GB fully encrypted HDD or 64GB SSD. 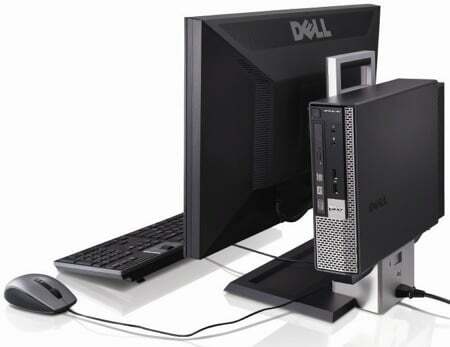 Dell said the 780 USFF can be specced up with single- an dual-core Celeron, Pentium and Core 2 processors, all of which connect to the machine's Q45 chipset. Graphics are handled by the integrated GMA 4500 engine. There's room in the casing for an optical drive. The on-board 180W PSU has a 90 per cent efficiency rating, Dell said. Curtis Campbell, Dell's OptiPlex Product Manager told Register Hardware that the 780 USFF's cooling system is well able to handle the heat the PSU generates in addition to what comes off the other components. Dell will supply the 780 USFF with a variety of optional mounts for connecting the machine to the rear of monitors and the underside of desks. 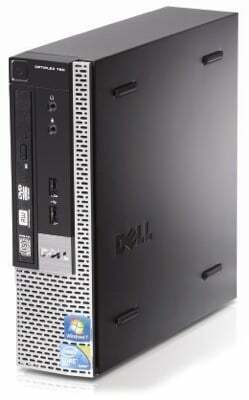 Dell today also upgraded its Optiplex 3 series, introducing the 380 range to replace the existing 360 set of machines. The new models use Intel's G41 chipset, allowing them to be specded with a choice of CPUs running from Celeron up to Core 2 Quad. Unlike their predecessors, the new machines all use DDR 3 memory, clocked to 1066MHz.